Current pom team members are welcome! Stay in dance shape this summer and go back better than you left! 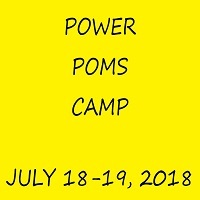 Get prepared for your middle school and high school teams by taking classes in pom, pom technique, pom jumps, hip hop, high kick, jazz, and a Pom mock audition. Ages 11 and up.